October is National Residents' Rights Month, a national effort to celebrate, honor, educate, and protect those living in long-term care homes and their families. The goal is to help not only the residents themselves but their families and communities recognize the rights of long-term care residents and learn how to speak up if they or someone they love are not receiving these rights. Each year the Department on Agency releases a theme in connection with National Residents' Rights Month. This year's theme is "Speak Out Against Elder Abuse!" 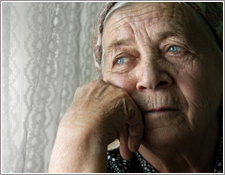 Elder abuse and neglect is a common problem plaguing our nation's elderly. Sometimes it is difficult to see the abuse and neglect that is happening. Other times we choose to ignore it because either it doesn't seem relevant or we just don't know what we can do about it. It is important that residents, care recipients, and their family members understand not only what is entailed in the categories of 'abuse' and 'neglect' but what they can and should do to prevent it. Neglect is the failure to care for a person in a manner which would avoid harm and pain, or the failure to react to a situation which may be harmful. Neglect may or may not be intentional. For example, a caring aide who is poorly trained may not know how to provide proper care. Abuse means causing intentional pain or harm. This includes physical, mental, verbal, psychological, and sexual abuse, corporal punishment, unreasonable seclusion, and intimidation." It is a violation of State and Federal law for any person, including facility staff, volunteers, visitors, family members or guardians, or another resident, to neglect or abuse a resident. Neglect and abuse should be reported immediately and should never be put off because you feel you need more information or evidence before reporting. If you even have a suspicion of abuse, report it. This month is about learning to speak up. If the elderly can't or won't speak up for themselves then don't hesitate to speak up for them and prevent further pain. WHERE and WHEN – The place where the incident happened and time and date of the incident. Provide as much background information as possible. A thorough report will help the investigator to address the situation quickly." If you don't know where to begin or don't think you have enough information/details to file an official report, contact the Eldercare Locator by telephone at 800-677-1116. The Eldercare Locator is a team of specially trained operators who can refer you to the local agency that can help you. The Eldercare Locator is open Monday through Friday, 9 am to 8 pm Eastern Time. When you call to report abuse, you do not have to prove the abuse is happening. Leave that up to the investigators. Answer their questions and give as many details as you can. If you are in or have been made aware of an emergency abuse or neglect situation in which someone could be seriously harmed if action is not taken immediately then call 9-1-1. Assisted living facilities are covered by individual state regulations rather than federal regulations. You will need to contact your states' Department on Aging to learn what your states' regulations are regarding assisted living. In order to help prevent abuse and neglect from ever occurring, carefully select the facility you or loved one will be living in. Before selecting a facility, consider alternatives. Make certain that the care your loved one needs can only be performed in a facility. Sometimes it is the better option to remain at home if the only care that is needed can be done by a registered home care agency or a family caregiver. Research the facility. Contact staff and set-up a visit. Make sure both parents and concerned children are satisfied with the care that will be provided in the facility, that it meets the needs of the one needing care, and that the facility seems like a safe and healthy environment. Whether you think you've found a good facility or you still just don't know where to begin your search, consult an expert. Citizen advocates are often available in your local area as well as your local area on aging. Care managers are an excellent resource to use when trying to find an appropriate facility. Care managers bridge the gap between you and the facilities by easily helping you find the perfect place that meets all of your needs. Home care laws and regulations are decided by each state. To find whether your state requires home care agencies to be licensed or certified go here: privatedutytoday.com/guides/licensing. If your state requires some sort of certification or license, make certain that the home care agency you choose to use for you or your loved one meets the state requirements. Elder abuse tends to happen in the place where the elder lives. Sometimes this is a facility, but most often this is in their own home where the abusers are adult children, other family members, and spouses or partners of elders. If abuse or neglect is happening between a professional caregiver either at an adult day care facility or in your own home, then report it immediately. Oftentimes it is much more difficult to report abuse and neglect occurring from a family caregiver or family member. Many times in the case of family caregivers, the abuse or neglect is not so much intentional as it is a natural side effect of all the stress and responsibility that come with the family caregiver role. If this is the case, seek help as a caregiver. Take some time off. Find a way to manage your stress effectively. Even hiring an independent home care agency or adult day care service to care for your loved one for part of the day can help reduce the chances of unintentional abuse and neglect. An advance directive for health care authorizes the person you choose (called a health care representative) to make health care decisions for you in case you are in an accident or are too ill or too disabled to make those decisions yourself. You can also use the advance directive to give your doctors and other health care providers instructions about the types of end-of-life care that you do want and that you do not want. An advance directive does not include the authority to make financial decisions. If you want to authorize someone to make financial decisions for you, you should sign a durable financial power of attorney." If the decisions are already made and the power to carry out those decisions is in the hands of a single neutral family member trusted by the elder then the chances of financial abuse as well as abuse of the elder's final wishes is much less likely. To set-up an advance directive or name a power of attorney, contact an elder law attorney for assistance. In preventing and reporting abuse and neglect, it is essential that the family and community be involved. The elderly are not always willing or able to report the abuse or neglect themselves. It is then the burden of neighbors, family, and friends to be watchful and report any signs of abuse occurring. If you are the family of an elderly loved one in a facility, visit them often. Check up on their care. Ask them questions but also listen to what they're not telling you through observation. Do their clothes seem to be fitting a little looser than usual from possible malnutrition? Do they seem more tired, or more secluded than normal from possible emotional abuse? Are their lips cracked and dry from possible dehydration? Pay attention. You could be the one who saves them from enduring a lot more pain and possibly from becoming physically and emotionally harmed. If you have concerns, speak up. Get to know the staff or the caregiver and let them know what you think. If nothing changes from speaking up then it's time to report it. Don't wait. Document problems as you see them with details and dates that you could later put into a report if needed. Start having family council meetings to discuss needs with all parties emotionally involved so when there is a problem, everyone knows about it and everyone can work to fix it. Elder abuse and neglect are a growing concern among the elderly. It is preventable, and it can be stopped. Not just this month, but every single month remember to speak out against elder abuse. You hold the power. Seniors and caregivers search online everyday for eldercare services and frequently find our web site. Last year, longtermcarelink.net averaged over 60,000 unique visits per month. We have become an important resource for people looking for help. We invite you to become a member of the NCPC. Your membership will include an advertising listing(s) on our site, your own personal sales (web) page, and access to the member section. The National Care Planning Council is dedicated to helping the American public deal with issues and challenges seniors face. Use the following link to locate eldercare and senior services in your area. Some of these services include Care Management, Elder Law, Estate Planning, Funeral Planning, Home Care, Medicaid Planning, Placement, Reverse Mortgage, and Veterans Benefits. The National Care Planning Council is a leader in providing books on timely subjects for long term care planning. Below are five of our popular books. "The 4 Steps of Long Term Care Planning"
"Protect Assets from Nursing Home Costs: Medicaid Secrets"
"Support for Those Who Help Veterans"
The National Care Planning Council and its affiliated members are dedicated to helping families recognize the need for long term care planning and to helping implement that planning. Integrity, honesty, and a genuine concern for those who are in need of (or may need) long term care are at the heart of our services.